The Third generation now begins. Now in order to obtain better speed than before, more players play with a racket with new material (eg. Titanium, Carbon Fiber, Aramid Fiber, etc). Good news for such players! JUIC has succesfully developed a rubber, which has very good characteristics for such blades. Air Condle is developed for better catapult effect, and better grip with the soft sponge with tension generates explosive spin. If we define the first generation of rubber and sponge as <rubber to produce spin, sponge to produce speed>, second generation to be powered up by speed-up treatment, this is the third generation to control the game and your opponent, with the harmony of racket and rubber+sponge. Made in Japan. Well, after putting in a good ~15 hours of play this week with the Aircondle I'm ready to put out a real review, or final thoughts on it. I bought mine from OOAK, got it for about $40 shipped and got it in 5 days. Setup: My setup is a Galaxy K-3, which is an All+/Off- 3 wood 2 Carbon-kevlar blade. I tried it with Tenergy 05 on one side and Aircondle on the other at first, then went to my usual setup of long pips on the backside. Speed: Right off I felt it was a very fast rubber, some of that was probably anticipation though. It has the ability of slowing down well though on slower shots, which adds to the control factor and keeps the ball on the table in shorter play. Even on my All+ blade, I felt this rubber was faster than any other I've used thus far, and I've played with Jo Platin, Tenergy 05 and 64, Tibhar Sinus and Nimbus, Bryce and Bryce Speed, IQUL, Bomb UFO, and many others. The speed on this blade felt close to the speed of Tenergy 64 on my friend's K-5, an OFF+ blade, but with the slower blade, it had more range in the middle areas. I found that the rubber has a high ceiling for speed, as in, the faster you swing and the more power you put into it, the more you keep getting out of it. It seems to get more speed out of power loops than direct smashes, not sure if it's because of the topsheet or an effect of the glue effect. It doesn't have as much of the effortless power of Tenergy with the spring sponge, but side by side, the AC was faster than the T05. Spin: I have to say that the T05 has better spin, both in slower and faster loops. Not to say that AC doesn't have good spin on short loops or faster loops, but none more really than any other modern rubber I've tried. You might also not be able to notice the spin as much due to the lower throw of the AC. You have to put more effort on generating the spin, but you will have to do that anyway to get the ball over the net, wheres T05 does those two for you with the higher throw. The AC does have better variety however, you can flat hit it with little to no spin to do a sliding shot as well. Control: I'm not too sure how they did it, but the AC, despite being faster, also has great control, my friend who tried it immediately clung onto it for that reason. It allows you to gauge just how much power you want to put into it, so you can place it well. The low throw helps to keep it down on the table perhaps, but it does has fantastic control, I felt like I was hitting with Tackiness Chop on the slow shots almost. Serves/Shortgame: This is the weakest point of the AC in my opinion. Pushes can be long and weak on spin if you don't really put some wrist into it. Also the serves at first were very weak on spin because of the insensitivity to spin on the topsheet, but at the end of the week, it started to get better and the topsheet became less slick as it went on. After cleaning and some use and wiping much sweat off of the face of it, it started to lose some of the slickness and the serves are noticeably better now. Now it's a lot better than before, at first it was so slick it was difficult to get any level of spin, but now it's maybe slightly above average in spin on serves. You just have to be patient with it. Odds and ends: Some odd little bits I figured out about it, I discovered than chopping with AC away from the table was very effortless and easy, lobbing and chopping on forehand was very easy to get back on the table due to the insensitivity to spin and the power. It didn't take long to get used to the low throw, even coming from Tenergy, took less time than going to it. At first I didn't like it on the backhand, but once I practiced with it, flipping the racket to block in warmups and drills as I'm lefthanded, it was pretty easy to keep on the table. Blocks were pretty easy, give and take, easier due to the topsheet, a little harder due to the lower throw, so you have to adjust. Looping chops was hard for me personally because I don't have that much experience with it and the low throw made the ball keep going into the net. Attacking weaker spun balls over the table however was very easy though, made doubles play a lot of fun. Sound...sigh...I don't know why people make such a big deal of it, but AC does pop, not as loud as my Jo Platin soft, but pretty good and more often. OK I finally got a chance to give this rubber a good workout. I glued it (normal glue) onto my Stiga Energy Wood, with a Roxon 500 (cheers Silver!) on the other side for comparison. As I mentioned before, the sheet looks of very high quality, and is made in Japan (as marked on the rubber). Topsheet is non-tacky but feels very grippy. Sponge hardness is a few degrees softer compared to the Roxon 500, but perhaps a little harder compared to the roxon 450 (which I have not measured). From the first hit I immediately noticed this rubber has good glue feel/effect, much more than any Japanese made rubber I've tried, and similar to latest generation tensors. Glue feel was more than on the R500. I must admit this totally surprised me, since none of the other JUIC rubbers have this! This rubber is quite fast on loops, a step up from the R500... on a faster blade this would no doubt be much faster again. Loops produced a nice dip on the bounce...the arc and dip on the JUIC was lower and more than on the P500, but my opponent (who was chopping) did not notice a lot of difference in spin. The throw is around medium, as does depend a little on how hard you hit the ball, as is the case with most tensors. It is definitely less than something like Tenergy 05, but similar to the R500. Spin was decent but not exceptionally high... it seem quite high on slower loops, but not really high on fast loops, at the point where the power really kicked in. Don't get me wrong, it's still a spinny rubber, but I've seen spinnier ones. It felt very similar compared to the R500 in terms of spin. Blocking was real easy with the rubber, and it seemed quite insensitive to incoming spin. I found the same with the R500. Hitting is great, it's real fast and loud, and also seems quite unaffected by spin... Hits felt more crisp with the Air Condle compared to the R500, but I'm not sure if they were any faster... but they were plenty fast enough on both. In the short game the Air Condle felt more springy compared to the R500...it needs a more positive stroke, but when you do it offer very good spin ability. Durability: The topsheet does not look fragile like many tensors do... it was definitely easier to cut as well, whereas Tensors often tear very easily. So as long as it maintains it's grip well, it will probably last quite a bit longer. This would make a great alternative for those that want the Tensor glue feel, but not the short lifespan that most tensors offer. 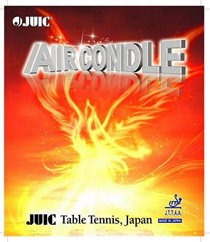 Finaly I got a chance to try Air Condle from Juic. First time I try AC i didn't like low throw so I put it away as wanted to do some practice with my mate. Day after I have gone to the club and got a chance to test AC in a mach against the player from first division. Pick Donic Enforce blade for test as it has very good control and is powerful on looping and smashing. Looping was great once i got used to low throw and was opening up bat little more. Serving looked to me that i have touch more spin then with T05 as opponent was struggling bit more. Hated that low throw at the beginning until got to my head to open the bat bit more as compared to T05 with high throw. Opening loop against backspin once I over come low throw was very good actually much better then T05 cos i had more control in that shoot. Short game pushing short backspin serves were easy as low trow was keeping ball low but flicks for same reason were a lot harder . Over all control on both wing looping attacking and smashing was a lot bigger then T05 once i overcome that low throw.To me AC is lot more powerful and spinier then T05,more powerful then R450 but little less spin. Only real thing that i don't like is low throw but if price is right I could get used to that . Air Condle is of great quality. Looks durable and tougher then tensors. To the date and all new gen tensor/bios plus T05, Air Condle is diffenently the fastest rubber (except Gewo Proton but lack of control and to bouncy ) I tried out with nearly best control and very good spin potential. I was lucky enough to get my hands on a sheet of this rubber over the weekend and took it out for a test run on my backup Stiga Hybrid Wood which made for an interesting direct comparison to the Roxon 450 & Proton 385 Sound on my main blade. All together I had a hit over 2 sessions, during which time I also asked my training partner (a much more skilled player) and a teammate to give me their thoughts on the rubber. Here are some of the observations we collectively made. * there is some glue effect probably a little more than the Roxon 500 but not as pronounced as the softer sponged 450, but this is typical as you go to harder sponges. * Control was unbelievable and immediately evident, I have a strong blocking and hitting game and this rubber immediately gave me the impression that I could make all my blocks, flat hits or controlled loops, more so than the Roxon 500. * It did not seem to react very much to incoming spin. * It seems better suited to slower, spin orientated loops than fast loops, my partner has a great loop and his slower spinner loops were much more effective than the faster ones he tried. * Sound was there but as loud as I normally get. * spin on serving was reasonable but nothing like tacky Chinese rubbers. * All 3 players commented on what we all felt was a bit of a lack of feeling at the point of contact, no sure if it is the topsheet or sponge but the incoming ball's energy seemed to be totally absorbed and dissipated and we were left with less touch than we would prefer. This will obviously suit some people but it is not my cup of tea, especially in returning serve and the short game. I am not sure if this is what haggisv was referring to in his comments on the short game and needing to be positive in your stroke play. To sum up this is an very good & versatile rubber that can do everything well whilst offering wonderful control. If priced as indicated by haggisv this rubber will be excellent value as it will deliver almost everything that the more expensive German sponged rubbers do but at a more affordable price. Unfortunately it just does not have enough raw speed and venom that I prefer for my style of play. NOTE: After discussion we determined why the speed seemed so different from the others above... it's because this player hits/drives the ball more, and was determining the speed from this. The first few reviews here measure the speed more in terms of looping, which is a more common way of determining the speed. Of course both conclusion are valid. Brands: TSP, Butterfly, JUIC, Avalox, Darker, Donic, 729, DHS, Globe.